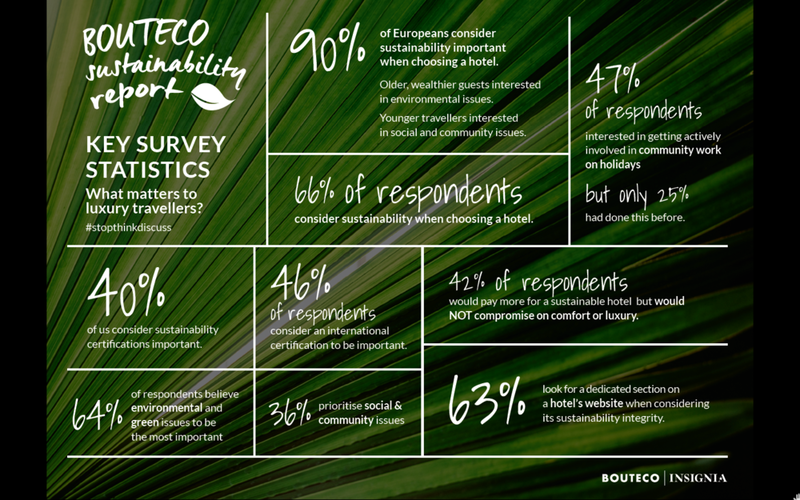 BOUTECO'S SUSTAINABILITY IN HOSPITALITY REPORT | Sustainability can be a compost heap of complicated and nuanced information. Let’s #StopThinkDiscuss what matters, cut through the greenwash and make hospitality a force for good. With Insignia, we surveyed hundreds of travellers and through this report we hope to pay it forward. No need to print any PDFs — instead, thanks to Insignia, we’ve created an eco-friendly microsite dedicated to the findings from our study on sustainability in the luxury hospitality sector. Trust, transparency and integrity are the hallmarks of a forward-thinking, Bouteco way of travelling and we aim to help hoteliers and consumers make better-informed choices. Just as the word ‘luxury’, has been abused and overused, ‘sustainability’ is a term at risk of becoming meaningless. Say it out loud: ‘sus-tain-a-bil-i-ty’ — those lumbering polysyllables hardly conjure the warm and fuzzy feeling we want from a holiday.